Reserve half (50g) of the melted cacao butter for the filling, combine it with room temperature coconut oil to stop it from resetting. Place buckwheat, almond flour, cacao, vanilla and salt into mixing bowl and combine vigourously. (Thermomix 30 sec/speed 3.) Press mixture into a 20cm flan tin. Place the cacao butter and coconut oil mixture together with the pecans, drained dates, lemon juice, maple syrup, vanilla and salt in a food processor and blend at a high speed for 1 minute, you will need to add up to 100ml or 1/3 cup of the reserved date soaking liquid to get it moving smoothly. Once you are satisfied the mixture is creamy in texture, pile it into the pie shell and shape into a slight dome as pictured. 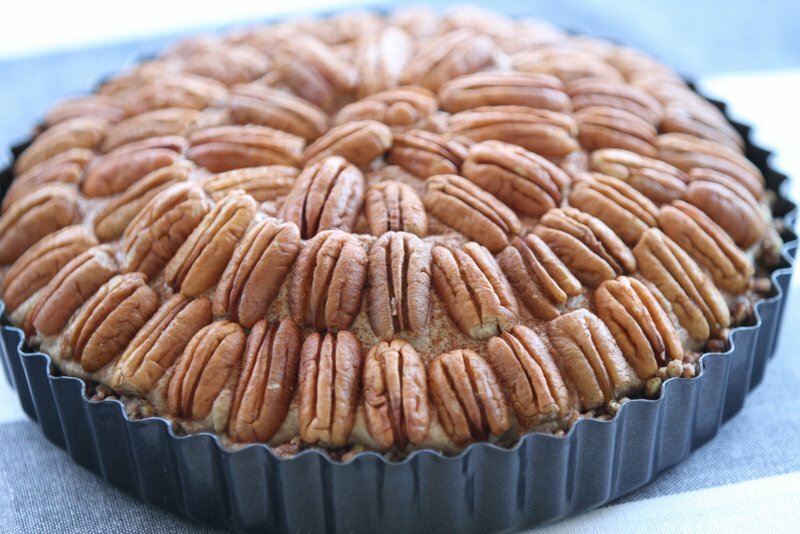 Decorate with pecan halves and dust the pie with cinnamon. Refrigerate for 3 hours or until firm. Serve glazed with additional maple syrup if you wish. Cacao butter – the smaller you have chopped the pieces the faster it will melt. Buckwheat groats – soak them 12 – 18 hours and you will notice the grains burst and they sprout, then place on a dehydrator tray and dry until crispy (around 8-10 hours). May be oven dried at ultra low temperature fan forced setting. Almond flour – the meal reserved from making ‘Almond milk’ that has been dehydrated or oven dried and then placed in the food processor and ground to powder, about 20 seconds on a high speed.